I was in a mood for Izakaya-style small dishes. One of the dishes I made for the night was another quick dish with my brand-new Toban (donabe skillet). 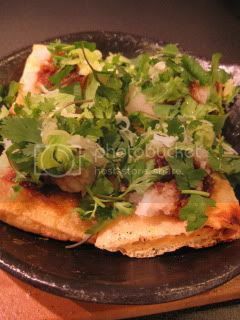 I made Shrimp-stuffed crispy abura-age (fried tofu pouch). This is another super simple dish. I made shrimp filling (minced shrimp, ginger juice, egg white, etc. 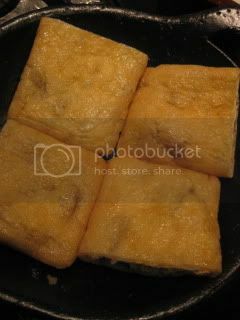 ), then stuffed it in abura-age (fried tofu pouch). The stuffed abura-age pieces were arranged in Toban and cooked both sides until crispy. The finished stuffed abura-age was garnished with grated daikon, soy sauce, cilantro, and scallion. That's it! The sizzling sound and aroma of soy sauce was quite irresistible. And the texture of abura-age was crispy and so nice. It was so easy to make and so delicious. I have posted the recipe on toiro's website. Hope you will try it sometimes.